Expedia can help you save loads with a Delemont vacation package. With all that extra money in the bank, you might even like to lock in a few more nights. Earn savings of up to 40,450 YEN* with a package deal on Expedia. With more than 400 partner airlines and 321,000 properties to mix and match from on our global database, you won't have any trouble crafting your ideal vacation. You can cancel or change almost any booking and you won't have to pay a cancellation fee to us. Almost ready to take off on your Delemont vacation? Haven't got a clue what things to add to your travel schedule? Don't stress — we'll give you a few of our top tips. History is full of incredible stories to be told and vital lessons to be learned. Drop by Lucelle Abbey and get a look into the past. There's an excellent range of things to keep you busy nearby. Would you like to add some greater meaning to your adventure? Go on a pilgrimage to Notre-Dame de la Prevote Church. No matter your beliefs, it's a great place to connect with the local religion. Still got some time on your hands? Venturing out on the fairways is a great way to enjoy the fresh air and have a ball. Sharpen up your skills with a round at LaLargue Golf Club. Finding a great place to stay is often critical to the perfect cheap vacation or luxury getaway. With only 2 accommodations in Delemont, it's advised that you book as soon as your dates are confirmed. If you like things such as dining rooms and indoor pools as well as comfortable beds, why not check out the amenities at the Le Petit Kohlberg (Petit Kohlberg) and the ibis Delemont Delsberg Hotel (37 Avenue de la Gare)? Got the tickets booked for your trip to Delemont yet? When you land, get ready to step out into EuroAirport (BSL). It's 18 miles (29 km) from the terminal to the heart of town. Situated in Delemont, this hotel is within 25 mi (40 km) of St. Jakob-Park, St. Jakobshalle, and Basel Zoo. Lake Biel and Basel Art Museum (Kunstmuseum) are also within 32 mi (52 km). Delémont Station is only a 2-minute walk. 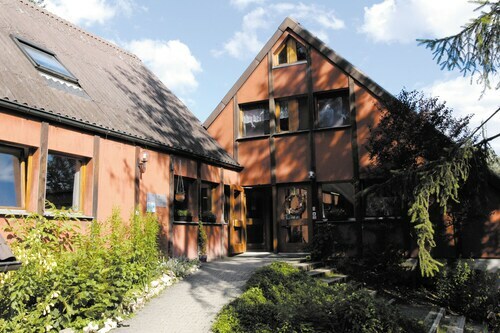 Situated in Delemont, this hostel is within 25 mi (40 km) of St. Jakob-Park, St. Jakobshalle, and Basel Zoo. Basel Art Museum (Kunstmuseum) and Caricature and Cartoon Museum are also within 25 mi (40 km). Delémont Station is 19 minutes by foot. 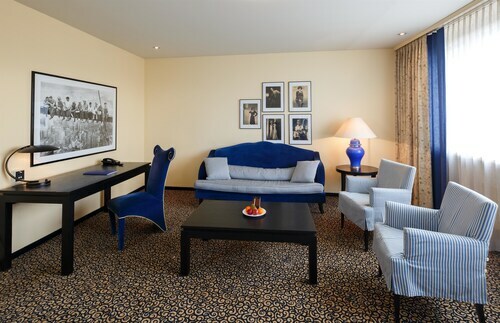 Located in the heart of Basel, this hotel is within a 15-minute walk of BIS Tower and Basel Zoo. St. Jakobshalle is 1.8 mi (2.9 km) away. Basel SBB Station is only a 2-minute walk and Marktplatz Tram Stop is 18 minutes. 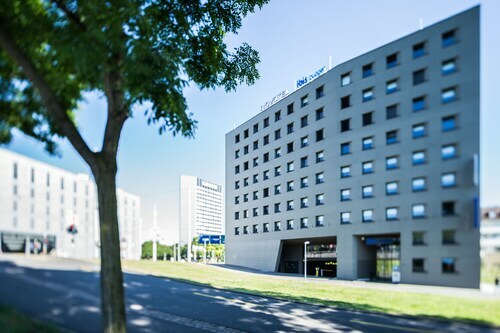 Located in Sankt Alban, this hotel is within 1 mi (2 km) of BIS Tower and Basel Zoo. St. Jakobshalle is 1.3 mi (2.1 km) away. Basel SBB Station is 12 minutes by foot and Marktplatz Tram Stop is 23 minutes. 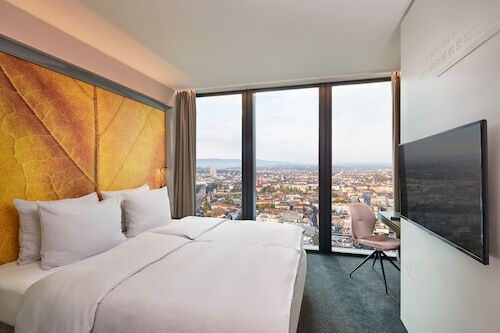 Hyperion Hotel Basel is steps from Congress Center Basel, and a 20-minute walk from the cobblestone streets and medieval churches of Old Town. Guests can walk 20 minutes to admire the exhibits at the Basel Historical Museum, crossing the Rhine on the way. 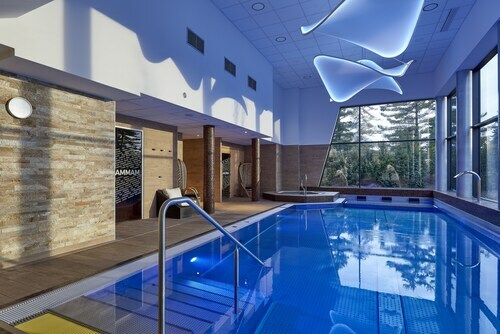 Situated near the airport, this spa hotel is within 6 mi (10 km) of Petite Camargue Alsacienne Nature Reserve, Eaux Vives Park, and Novartis Headquarters. Sankt Johanns-Park and Basel University are also within 6 mi (10 km). Located in Basel City Centre, this hotel is within a 15-minute walk of Music Museum and Basel Zoo. St. Jakobshalle is 2.2 mi (3.5 km) away. Marktplatz Tram Stop is 9 minutes by foot and University Tram Stop is 11 minutes. Situated in the historical district, this hotel is within 1 mi (2 km) of Spalentor and Basel Zoo. St. Jakobshalle is 2.5 mi (4.1 km) away. Marktplatz Tram Stop is 8 minutes by foot and University Tram Stop is 8 minutes.